It seems that exercising has become some sort of a privilege because the gym membership is expensive and the equipment you will need in the gym is also expensive. Your alternative is to make your own home gym and you will see that it isn`t really expensive if you use some alternatives to your favorite gym equipment. You will see that there are a lot of programs on the internet that don`t require you to spend a lot of your money in order to accomplish your goals. You can do yoga and even Pilates without any need of equipment. You will only need a rug. It is one of the most recommended item and has gained a lot of popularity recently. You can buy quality foam rollers starting from 10 dollars. If you want to choose the DIY route then you can buy your own PVC pipe and wrap it in a beach towel. This item is priced usually under 20$ and it is a common item for doing exercise. You can to planks and crunches using it in order to build your abdominal muscles. This item is really versatile in the fitness industry and you can use it in a lot of exercises. It is excellent for abdominal work because it works the spine and isolate the stomach muscles. You can use this ball as a bench in some exercises. The ideal choice for you is a stationary bike. These quality stationary bikes can be found at any store and the price will be around a couple of hundred dollars. You can also choose to buy a treadmill. You can adjust the stationary bikes so you won`t have to think that it won`t fit your body. Consider looking for some gyms that go out of business. They usually sell their equipment to the public for cheaper prices. They are perfect for strength equipment. They are also cheaper than some large gym machines and they will help you with the strength training. 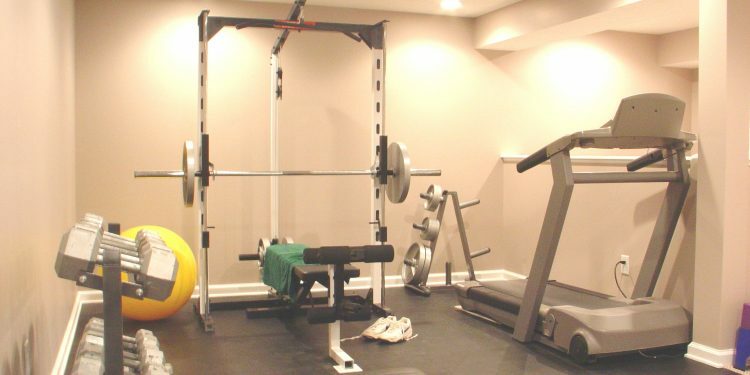 They will form the foundation for any budget home gym. They are a great way to take use of some spare construction materials. Fill exercise bags with sand or gravel and tape the opening well. You can use this sandbags for any kinds of exercises. You can use resistance bands when you do any exercise that requires dumbbells. Find a place where you can safely anchor your band in order to do exercises with it. You can find these at a price ranging between 15$ to 25$. You will need to be sure that you have a really sturdy door frame. When you are doing push-ups, this bar will be a really great thing for your wrists. They are more durable than ordinary plates and you will have the possibility to drop them on the floor without smashing anything.